An oil free, crunchy, Italian recipe with lemon, orange and pistachio. Preheat the oven to 325 degrees F. and line a large baking sheet with parchment paper. In a mixing bowl, stir together flour, cornmeal, baking powder, and salt. In a second bowl, using an electric mixer, beat the eggs and sugar until pale yellow and fluffy, about 3 minutes. Add the orange and lemon zests to the flour mixture, then add the flour mixture to the eggs and sugar and stir just until blended (the dough will be soft and sticky). Stir in the pistachios. Let stand for 5 minutes. Transfer the dough to a baking sheet lined with parchment or non-stick foil. Divide in half and form two slabs, each about 11x4 inches. Space slabs 3 inches apart and bake until light brown, about 35 minutes. Cool the slabs for 5 minutes. Cut the slabs crosswise on the diagonal into 1/2-inch thick slices. 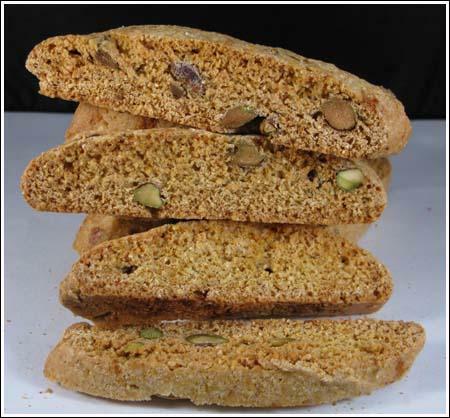 Arrange the biscotti cut side down on the same baking sheet. Bake until the biscotti are pale and golden, about 25 minutes. Cool the biscotti on the baking sheet for 5 minutes. Using a metal spatula, transfer the biscotti to a rack and cool completely. This recipe is adapted from Giada's version. She dips hers in chocolate. Not a bad idea! Also, make sure to use finely ground cornmeal. If you can't find it, you can grind regular cornmeal in a coffee grinder, but make sure it is very, very, fine or the biscotti will have a slightly gritty texture to it.